Are open containers of alcohol legal in Key West? A common misperception is that open containers of alcohol are permitted in Key West city limits. While in fact, the opposite is true. 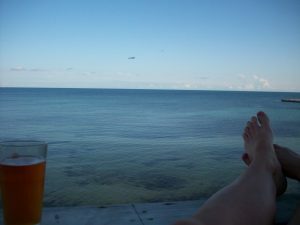 The Key West Municipal Code, § 18-87 prohibits open containers of alcoholic beverages in public. However, ordinance 18-87 subsection (d) dictates that there shall be one verbal or written warning for any first time offender of this section, provided that compliance is achieved. Second or subsequent violations are subject to arrest as a misdemeanor ordinance violation. As such, most out of town visitors are unlikely to find themselves subject to a documented warning, and an arrest thereafter. As a practical matter, local law enforcement quite often chooses to “look the other way,” rather than issue warnings to the thousands of visitors spilling onto Duval Street from the local bars on a given evening. The best practice is, of course, to follow the city ordinance. However, should you find yourself confronted by local law enforcement regarding an open container of an alcoholic beverage, be polite, and the most likely outcome is a warning and a directive to throw away your drink. Should you find yourself in need of legal assistance or arrested on vacation, please do not hesitate to call the Law Offices Robertson & Hunter, LLP.